Like all good things, Hana Kitchen was worth the wait. I’d indulged in its great tasting, $6.50 chicken rice bowls many a time during the fall when the restaurant originally opened; however, its aesthetics weren’t nearly as grand and glamorous (for Isla Vista’s standards) back then as it is now. Nonetheless, I was still dismayed when it closed, and subsequent bike rides past the restaurant’s locked doors were painful reminders of happier times and chicken bowls of past days. “When?” was the only question on my mind; I waited anxiously for the day when the flavors of precious chicken rice bowls would grace my palette once again. Now, I’m thrilled to say that May 13 marks that day. Plush, contemporary outdoor seating invited me into the restaurant, and upon my entrance, four fierce looking Bruce Lee visages on the wall greeted me. The sounds of “Paint It Black” by The Rolling Stones echoed in my ears, and my growling stomach, which seemed to understand that we were home again, accompanied the music with its own song. A friendly staff complemented the atmosphere, although the initially thin-looking menu contrasted. I, like any courageous and experimental college student, decided to order—what else?—my friend, the chicken rice bowl. 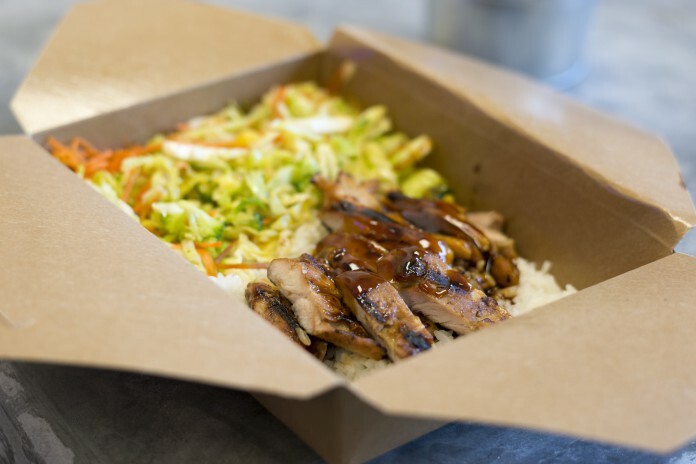 It was a whopping helping of rice, a good amount of chicken smothered with teriyaki sauce, and the traditional veggies that one would associate with a solid, well-rounded rice bowl. As I ordered my healthy chicken rice bowl, I caught sight of the official menu and noted how short it was. It only offers two types of bowls—chicken or vegan, either of which can be supersized for an extra $2.00; vegan tacos for $2.50, with the choice of teriyaki mango sauce or spicy sweet and sour; and then the boba menu, which is a must-have. Hana Kitchen offers boba milk tea in the two traditional varieties, “ice milk” or “slush.” Besides offering the traditional black or green tea flavors, they also offer mango, passion fruit, peach, lychee, and yogurt flavors for the more selective customer. Every order comes standard with boba, the black tapioca balls first popularized in Taiwan. My friend ordered a peach flavored “slush,” and it was served full to the brim in a positively massive 25 ounce cup. The ice was ground to a consistency reminiscent of a 7-11 slushie, not too fine and not too coarse. He reported that the peach flavor tasted fresh and pleasant, and it was not too overpowering like other boba tea drinks. His only complaint was that his drink was a bit too sweet, and that the boba pearls became frozen after sitting in the ice for too long. Two of my other friends and Hana Kitchen converts raved about the vegan bowl, and added that they believe the service at Hana Kitchen is some of the best they have seen in IV. All in all, my experience at Hana Kitchen exceeded my original expectations. Granted, their menu isn’t enormous and the food is probably not the finest dining you’ll ever come across. But for the price and the vibes, Hana Kitchen is a godsend jewel of scrumptious, health-conscious Asian/vegan cuisine. Welcome back, Hana Kitchen.